Władysław Strzemiński lived in Łódź from 1931 until his death in 1952. The 1930s, late 1940s (after the war) and 50s were important periods in the development of the city and especially its architecture. Which buildings would the Polish painter walk by, while wandering through Łódź? Władysław Strzemiński was a famous Polish art theoretician, painter, designer of 'functional' prints and a pioneer of the Constructivist avant-garde of the 1920s and 1930s as well as the creator of the theory of Unism. He developed his radical modernist theory of Unism during the interwar period, following the artist's move from Russia to Poland in 1922. Unism began as an artistic experimentation through an analysis of form in painting and was soon expanded to other arts - sculpture, architecture, and typography. Strzemiński moved to Łódź in 1931 and stayed there until his death in 1952. On the eve of World War II, Łódź was a city of 672,000 people, making it the second biggest city in Poland. In the inter-war period, Łódź gained a number of prestigious buildings, which were meant to transform Łódź from an industrial district into the capital of an important region. 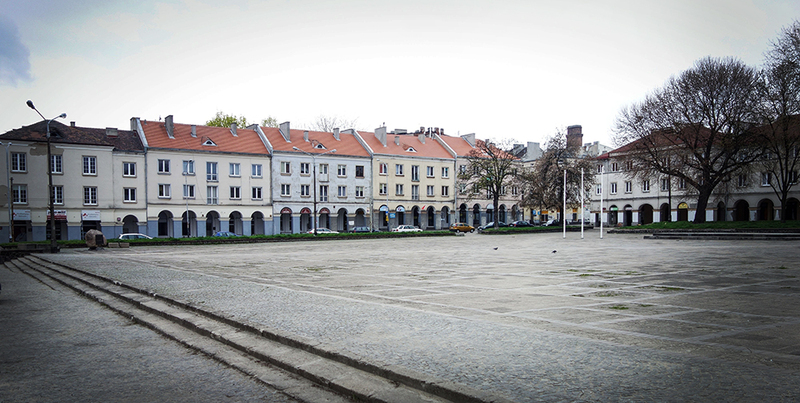 Since Łódź was not destroyed too devastatingly during the war, Łódź was taken under consideration for the new capital of Poland – these new buildings were supposed to be a symbol of this honour.. Walking through the city, Strzemiński saw many of these buildings rise, and his presence probably graced many of them. This is the housing development where the artist himself lived. In the inter-war years, Łódź struggled with housing problems – workers from the factories lived in very poor conditions. With that in mind, between 1928 and 1931, the municipal council built twenty-one four-story blocks of flats in Polesie Konstantynowskie (a nature reserve in Łódź). 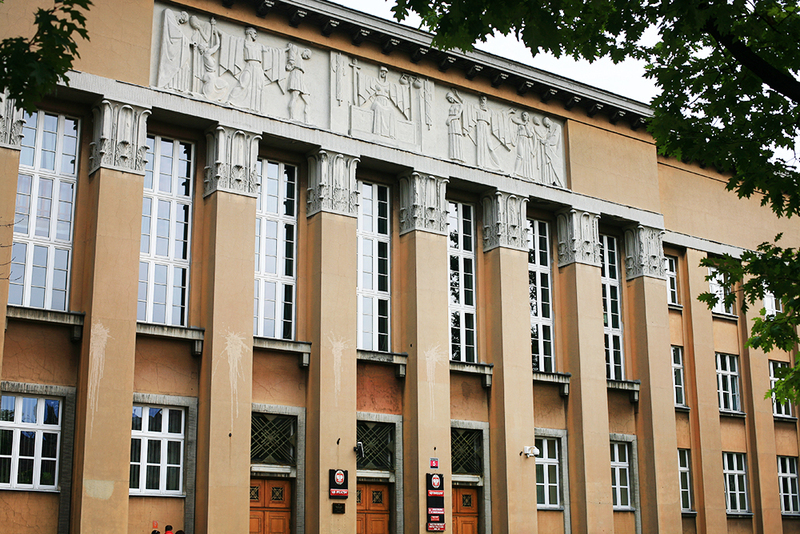 The simple, modernist buildings are the work of Jerzy Berliner, Jan Łukasik, Witold Szerszewski and Miruta Słońska. Although the apartments were small (40–60 square metres), their amenities were luxurious: each apartment was equipped with a sewage system and were connected to the water supply system. Unfortunately, such luxury was too expensive for factory workers, so officers and intellectuals quickly settled in the flats. Strzemiński and his wife, Katarzyna Kobro, lived at 45 Srebrzyńska Street. 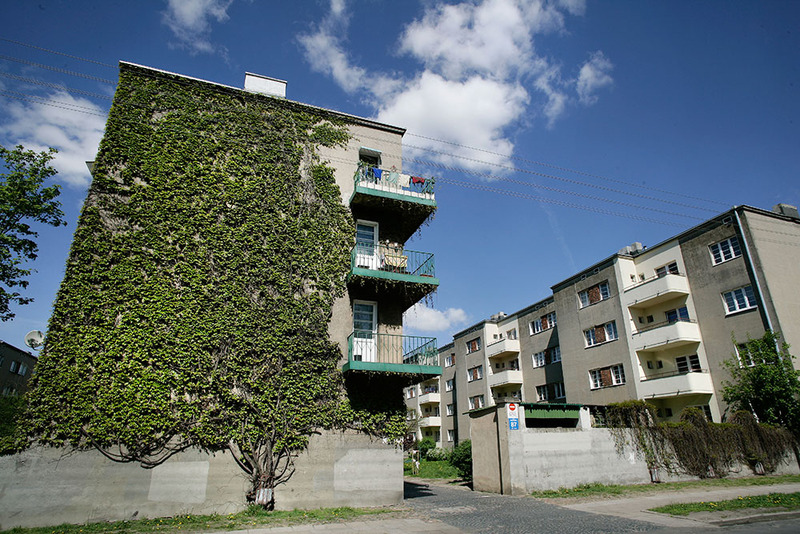 The development is considered one of the most interesting implementations of pre-war functionalism in Polish architecture (even despite the modern renovations ruined its original façade). In Strzemiński’s time, the building known today as the Łódź House of Culture served a completely different purpose. It was elevated between 1935 and 1939 as a ‘house-monument’ in honour of Marshal Józef Piłsudski. Financed through private contributions, it was one of many similar buildings that were being elevated at the time in Poland (all honouring the Marshal). The edifice, designed by Wiesław Lisowski, was intended to be the headquarters of independence organisations and the centre of their educational activity. After World War II, the façade was covered with sandstone, which wasn’t possible before the war, and in 1953, the building was turned into a cultural centre. In the 1980s, two new wings were added to the building – an extension envisaged by the pre-war architect. Thanks to geometric cubes of different sizes and pilaster strips, subtly dividing the elevation, the House of Culture has managed to preserve its elegant and modernist shape. Władysław Strzemiński had a few cases in court in his lifetime, it’s possible then that he might have visited the new district court on Dąbrowski Square. 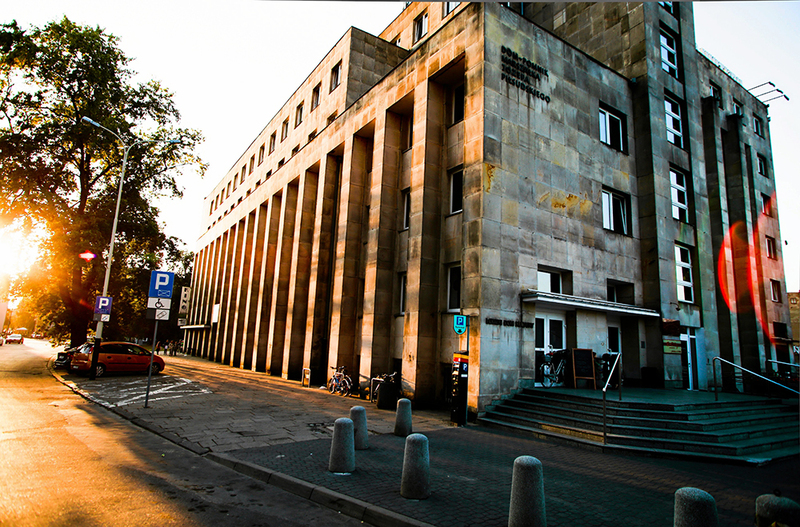 This impressive building was constructed between 1927 and 1932, based on the design by Józef Kaban (after the war he changed his name to Korski). Initially, the design was much more ornamental, but because of insufficient funds, it had to be simplified. The change proved good: a monumental building with a modern classicist form and a low relief frieze and elegant front wall – an echo of an antique colonnade. The raw, rigid structure underlines the authority and seriousness of the institution it houses. Although Polish Television did not start broadcasting from its Łódź headquarters until after Strzemiński’s death, the construction of the city’s tallest building must have drawn everyone’s attention at the time. It all began in 1948 with a contest for the Textile Centre’s new headquarters – the first sky scraper in Łódź was supposed to stand on the intersection of Narutowicza and Sienkiewicza Streets. The victorious design by Jan Krug envisaged a complex of modern and symmetrical buildings with an asymmetrical adjoining skyscraper. 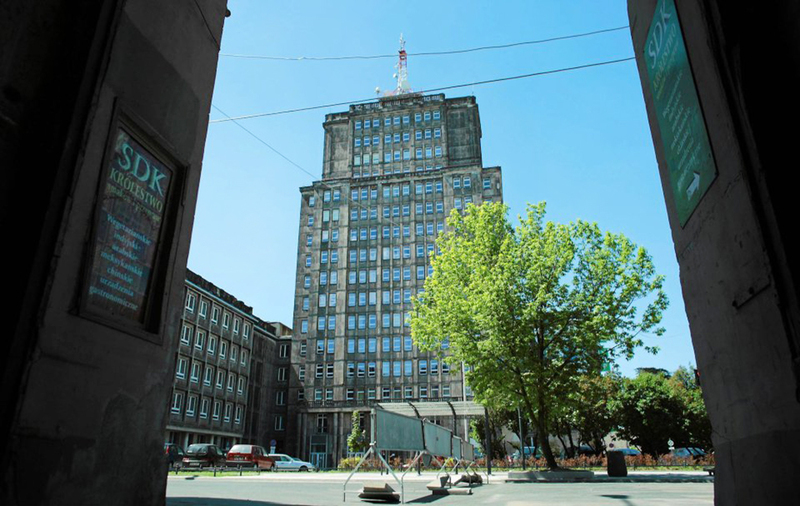 Before the project was finished, social realism was introduced in Poland and the building had to be redesigned to fit the new style: the tower was given a coping (which completely ruined its lines) and a modernist façade – pilasters running from the bottom to the top. In 1956, the Textile Centre was closed down, so the building was taken over by Polish Television, where it remains to this day. The skyscraper, together with its antenna, is 67 meters high.